Returned after three and half years to find this place has gone from strength to strength. The Fullers beers are still well kept, and the food is thoughtfully cooked with prices matching quality. Decor is pleasantly rather than self-consciously quirky. 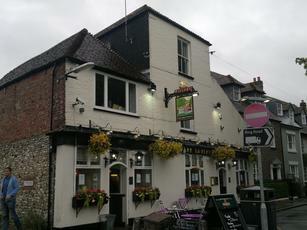 Definitely worth frequenting as there is much to enjoy about this comfortable, welcoming tavern. We will surely not delay our next visit for so long. Good pub opposite the pretty Priory Park. Well kept beers from the Fullers range, maybe with one guest ale too. Clean and well designed interior with a few quirky furnishings but quite tastefully done. Appealing to a wide mix of punters (but excluding chavs or yoofs), and events such as live jazz. Professional service. The discerning man/woman's local in Chichester?